Flea market season is right around the corner and the Brimfied buzz is starting to pick up. Dealers are starting to get their inventory ready, shoppers are planning their trips, local businesses are preparing for the swarms of people and we are signing up dealers and getting a new update to the app ready for release. Brimfield is one of the most well known flea markets in the world, but it is also still a premier antiques and collectibles show. Some of the dealers (and shoppers!) in Brimfield are incredibly knowledgeable about the items they specialize in. In general, they are also very willing to share information with shoppers and other dealers. They love talking about their fields of expertise and helping people add to their collections. Many of these specialized dealers are the backbone of the show and have seen it shrink and grow and change many times over the years. While high-end antique and collectibles dealers maintain a strong presence at the show, in the past few decades Brimfield has also become a mecca for stylists and designers of all kinds: Interior designers, set designers, costume and fashion designers, visual merchandisers, wedding and event planners, food and restaurant stylists, furniture and textile designers. You can find them all walking the fields. Sometimes they’re filling entire shipping containers to furnish a flagship store or trendy restaurant. Sometimes they’re buying specific pieces as props for a period movie or television set. Sometimes they’re just taking photos and jotting down notes. We have met people with the most interesting careers and interests in Brimfield and that never gets old! Then, of course, there are casual shoppers. Some are looking for items for their home and some are just there to enjoy the atmosphere with family and friends. People enjoy seeing items from their childhood and taking in the visual inspiration at every turn. We honestly love hearing everyone’s stories about Brimfield and would love to hear yours! 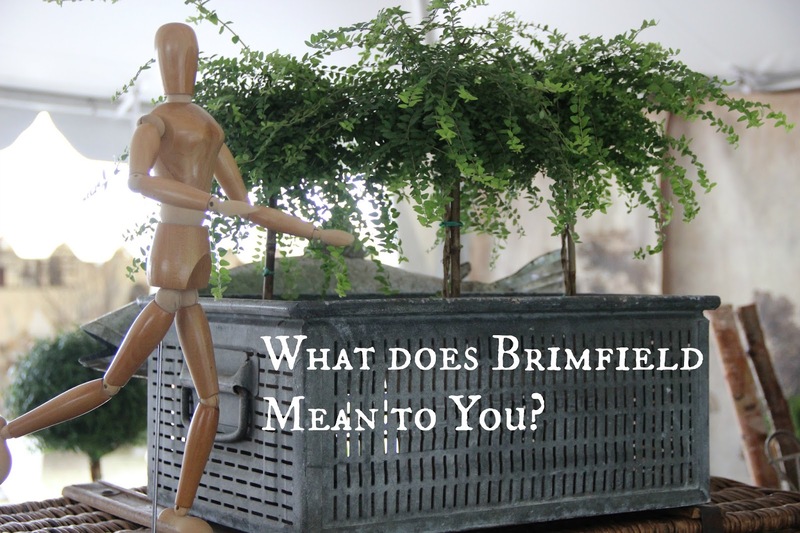 What does Brimfield mean to you? How long have you been attending? Why do you come year after year? Is your interest in the show personal or professional? What’s your favorite Brimfield memory? What will you be looking for this year? And while everyone is looking forward to a strong 2016 show season, let’s take a look back at how much fun we had in 2015!